The iconic "Pillar of Autumn" from Halo, now in LEGO form. And it's damn huge—not exactly minifigure-scale, needing more than one person to move it. According to its builder, Lee Jones, it took 3.5 years to complete it and it weighs a massive 220 pounds (100 kg). 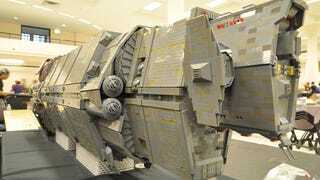 It's around 7 feet (2.15 meters) in length and the building blocks cost around $7,000. Woah. Here are some more shots by El Barto from all angles. The engines look insanely cool.